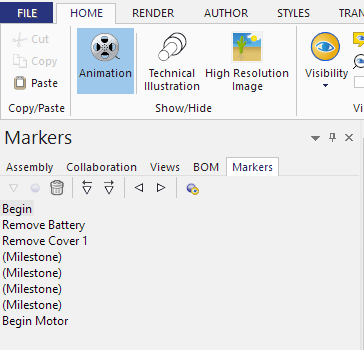 SOLIDWORKS Composer has some great tools to help create animations among which are Markers and Milestones. These two tools allow you to flag significant points on the timeline in your animations. Markers and/or milestones can be used to organize the timeline, help make interactive content and create image output. In this blog, I will focus on using markers and milestones to produce images from key points on the animation timeline. Markers are used to flag significant points in an animation. Markers are created by clicking on the marker bar at the desired point on the timeline. You can change the text of the marker when it’s created or rename it later by right-clicking on it and choosing “Rename Marker”. You can also move markers on the timeline by dragging it to the desired point. Animation blocks can be moved with the marker by holding Alt as you drag, and animation blocks and standard animation keys can be moved by holding Shift + Alt as you drag the marker. Milestones are used to identify key moments in the timeline and can then be used to produce images of the scene at that point. 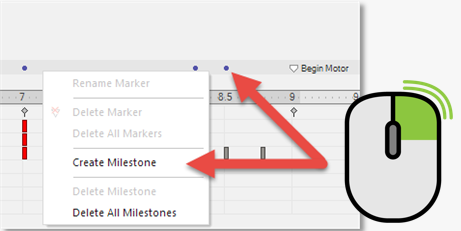 Milestones are created by right-clicking on the marker bar at the desired point on the timeline and choosing “Create Milestone”. They are represented by a blue dot on the timeline. Unlike markers, they cannot be renamed but can be moved just like milestones with that same Alt and Shift + Alt modifiers used for markers. Once they are created, markers and milestones can also be managed in the Markers pane. TIP: Markers can also be used to control an animation. For example, an animation can be played to the next marker by clicking on it in the Markers pane or by using a playmarkersequence:// event link. Both markers and milestones can be utilized to create images of the scene at any given moment on the timeline through the High Resolution or Technical Illustration workshop. In these workshops, an image can be generated for each marker or milestone, or both. In the timeline shown here, there are 4 markers and 4 milestones. 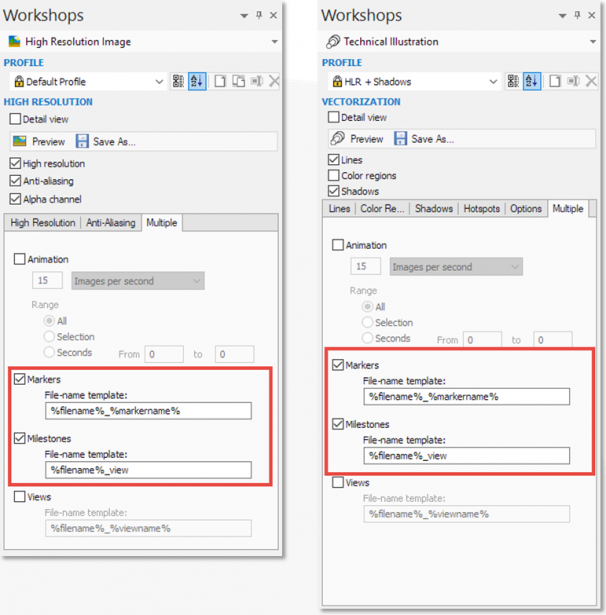 If the boxes for both markers and milestones are checked in the High-Resolution Image workshop, then a total of 8 images will be created that represents the scene at that point in time using the settings in the workshop. Using Markers and Milestones can help organize the timeline, create interactive content through event links, and save a lot of time when you need to create a lot of images quickly from an animation. Give them a shot in your next project! If you have any additional questions or need help, please contact GoEngineer technical support by phone at 888-559-6167 or by email at support@goengineer.com. GoEngineer delivers software, technology and expertise that enable companies to unlock design innovation and deliver better products faster. 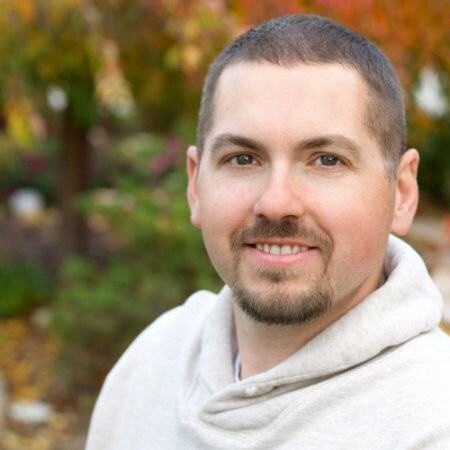 With more than 30 years experience and thousands of customers in high tech, medical, machine design, energy and other industries, GoEngineer provides best-in-class design solutions from SOLIDWORKS, Stratasys, CAMWorks, Altium and Product Lifecycle Management (PLM). For more information, visit goengineer.com.